Mouse anti Bovine MHC Class II DR antibody, clone CC108 (MCA5656GA) used for the evaluation of MHC class II expression on bovine myeloid cell sub-populations by flow cytometry. 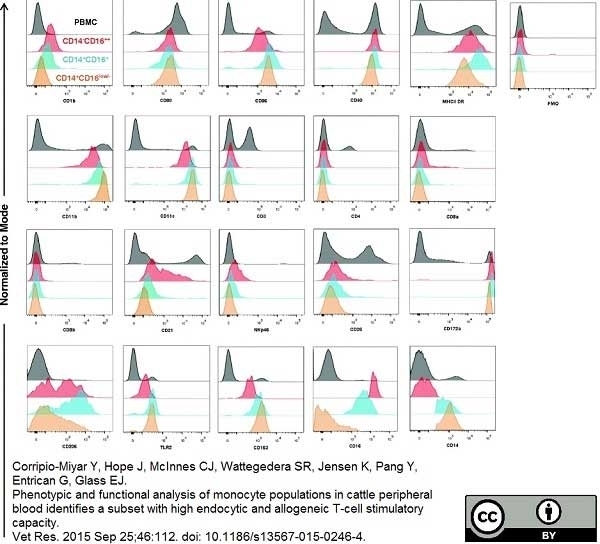 Phenotypic profiles of bovine myeloid cell sub-populations. Live gated PBMC were assessed for expression of CD16 and CD14 and a panel of molecules associated with antigen presentation, co-stimulation or specific cell lineages (see Table 1) by 3 colour flow cytometry. PBMC were stained with primary mAb to the specific molecules indicated and then with an isotype-specific PE conjugated secondary, followed by CD16 and CD14 conjugated to FITC or Alexa Fluor 647 respectively. Live, single PBMC were gated based on the expression of CD16 and CD14 as detailed in Figures 1 and ​and 2C.2C. Histograms show the levels of expression of selected markers in the cell populations studied, CD14−CD16++ (red), CD14+CD16+ (blue) and CD14+CD16low/- (orange) compared to PBMC (black). Data shown are for one representative animal of four animals. From: Corripio-Miyar Y, Hope J, McInnes CJ, Wattegedera SR, Jensen K, Pang Y,Entrican G, Glass EJ. Phenotypic and functional analysis of monocyte populations in cattle peripheral blood identifies a subset with high endocytic and allogeneicT-cell stimulatory capacity. Vet Res. 2015 Sep 25;46:112. 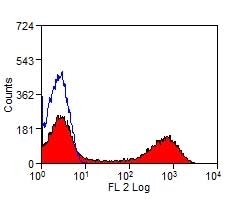 Mouse anti Bovine MHC class II DR antibody, clone CC108 (MCA5656) used for the evaluation of MHC class II expression on peripheral blood cells by flow cytometry. Monocyte/macrophages and MoDCs express IL-10 and TGF-β, and induce proliferation of IL-10+ γδ T cells. 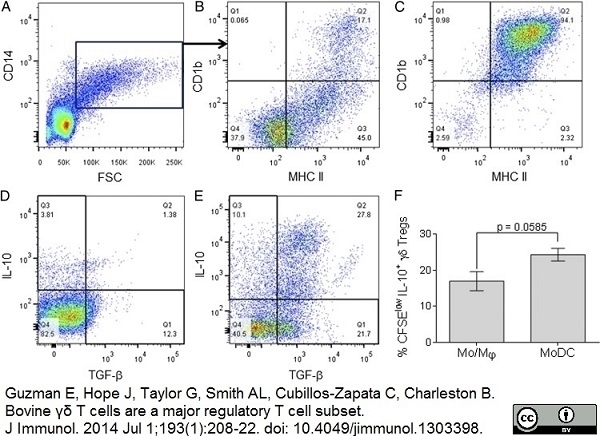 Peripheral blood monocyte/macrophages expressing CD14 (A) and expression of MHC class II/CD1b (B) in CD14+ cells. After a 3-d culture in the presence of GM-CSF and IL-4, the cells increased expression of MHC class II and CD1b (C). IL-10 and TGF-β expression in ex vivo CD14+ cells (D) and cultured MoDCs (E). Both monocyte/macrophages and MoDCs induced the expansion of autologous IL-10–expressing γδ T cells (F). Bar graph shows means (n = 10) and error bars indicate SEMs. Representative plots of cells obtained from 10 different animals analyzed in duplicate. Quadrants were placed based on isotype and fluorochrome controls. From: Guzman E, Hope J, Taylor G, Smith AL, Cubillos-Zapata C, Charleston B. Bovine γδ T cells are a major regulatory T cell subset. J Immunol. 2014 Jul 1;193(1):208-22. CD8α− SIRPα− ALDCs express cytokines that induce γδ T with a regulatory phenotype. Phenotypic analysis of bovine ALDC subsets includes FSChigh MHC class II (A), SIRPα and CD11c (B), and SIRPα and CD8α (C). Cells were fixed, permeabilized, and stained for intracellular TGF-β and IL-10. DCs were gated on SIRPα+ CD8α− (D), SIRPα+ CD8α+ (E), and SIRPα− CD8α− double negative (F). Dot plots are representative of cells from five different animals. (G–I) SIRPα− CD8α− ALDCs are capable of inducing γδ T cells with suppressive phenotype. (G) Subpopulations of ALDCs were FACS sorted and cocultured with autologous MACS-sorted γδ TCR+ T cells for 5 d. Proliferation was measured by CFSE dilution and intracellular staining of IL-10 by flow cytometry. (H) FMDV-specific proliferation of CD4+ T cells in the absence or presence of in vitro–expanded autologous γδ T cells by SIRPα− CD8α− ALDCs and in Transwell plates with or without blocking anti–IL-10. 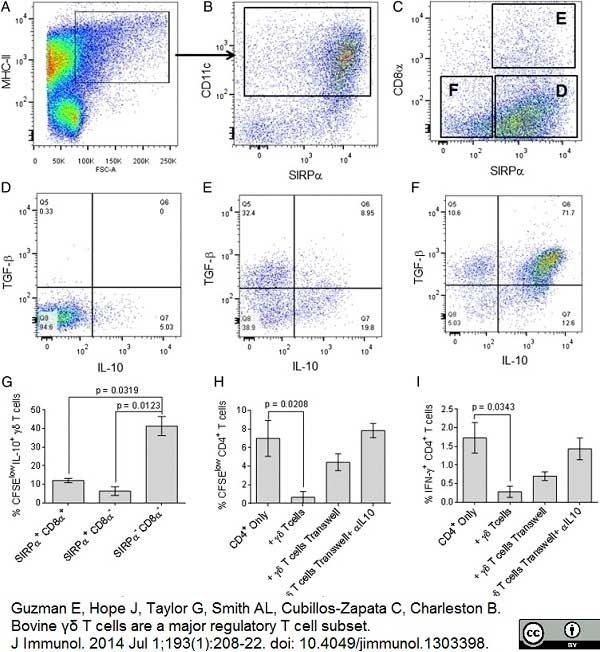 (I) FMDV-specific IFN-γ responses in CD4+ T cells in the presence or absence of in vitro–expanded autologous γδ T cells SIRPα− CD8α− ALDCs and in Transwell plates with or without blocking anti–IL-10. Bars indicate means of cells from four different animals analyzed in triplicate, and error bars indicate SEMs. Mouse anti Bovine MHC class II DR antibody, clone CC108 recognizes Bovine MHC Class II DR. MHC Class II molecules are constitutively expressed on antigen presenting cells such as dendritic cells, B lymphocytes, monocytes, macrophages, activated T lymphocytes and may be induced on a range of other cell types by interferon gamma. The major histocompatibility complex (MHC) is a cluster of genes some of which are important in the immune response to infections. In cattle, this complex is referred to as the bovine leukocyte antigen (BoLA) region. There are 2 major types of MHC class IIa molecules encoded by the BoLA which are DR and DQ each composed of an alpha and beta chain. Stephens, S.A. & Howard, C.J. (2002) Infection and transformation of dendritic cells from bovine afferent lymph by Theileria annulata. Parasitology. 124 (Pt 5): 485-93. Yamakawa, Y. et al. (2008) Identification and functional characterization of a bovine orthologue to DC-SIGN. J Leukoc Biol. 83 (6): 1396-403. Corripio-Miyar, Y. et al. (2015) Phenotypic and functional analysis of monocyte populations in cattle peripheral blood identifies a subset with high endocytic and allogeneic T-cell stimulatory capacity. Guzman, E. et al. (2014) Bovine γδ T cells are a major regulatory T cell subset. J Immunol. 193 (1): 208-22. Childerstone, A.J. et al. (1999) Demonstration of bovine CD8+ T-cell responses to foot-and-mouth disease virus. J Gen Virol. 80 ( Pt 3): 663-9. Sopp, P. et al. (1994) Detection of bovine viral diarrhoea virus p80 protein in subpopulations of bovine leukocytes. J Gen Virol. 75 ( Pt 5): 1189-94. Bembridge, G.P. et al. (1995) CD45RO expression on bovine T cells: relation to biological function. Gibson, A.J. et al. (2016) Differential macrophage function in Brown Swiss and Holstein Friesian cattle. Vet Immunol Immunopathol. 181: 15-23. BMC Veterinary Research. 13 (1) [Epub ahead of print].